A view of Christian Hackenberg Sunday on CBS Sports Network. 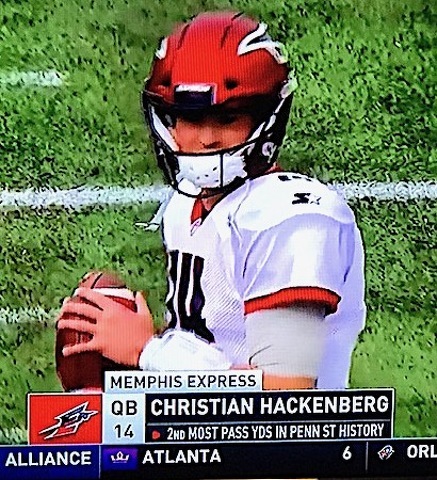 On Sunday, Hackenberg started for the Memphis Express in their first-ever game in the American Alliance of Football pro league. His performance was less than historic. The Birmingham Iron, playing at home at Legion Field in Alabama, beat Hackenberg and Memphis 26-0. -- 10 of 23 for 87 yards passing. -- One tipped pass for an interception, which set up an Iron field goal. -- A majority of completions that were “slants over the middle,” as CBS Sports Network color analyst Adam Archuleta pointed out. Again. And again. -- A whole host of overthrows, tipped balls and drops. -- Two failed trips inside Birmingham’s 35-yard line following turnovers, as Memphis came away from both second-half chances with zero points — despite a fourth-and-1 inside the 10 on the second opportunity. -- An intentional grounding call. -- A 39-yard touchdown pass on a flea-flicker...that was called back. The Memphis offense included running back Zac Stacy, who twice ran for over 1,000 yards for James Franklin at Vanderbilt. Stacy had 58 yards on 12 carries vs. Birmingham. For the rest of the gory details, the full stats are here. The loss dropped Hackenberg’s record as the starting quarterback in season-openers to 2-5 — in high school (0-3 at Fork Union), college (2-1 at Penn State) and the pros (0-1 at Memphis). He is 42-32 all-time as a starting QB. Those two season-opening wins at Penn State were gems — a 24-17 win over Syracuse in MetLife as a frosh under Bill O’Brien in 2013 and a 26-24 victory over UCF in Dublin, Ireland for James Franklin's first game as Penn State head coach. 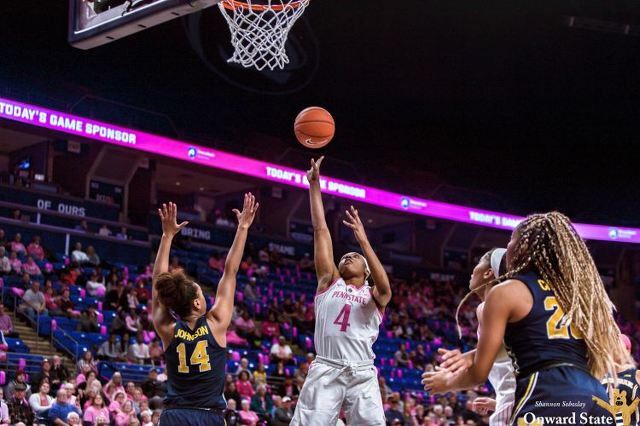 The season-opening loss came at Temple, when Penn State fell 27-10 to open the 2015 season. Sunday, at Legion Field, looked a bit like that Temple game (179 weeks and a day ago), at least as far as Hackenberg is concerned. Hackenberg’s last win as a starting quarterback was on Oct. 31, 2015, a 39-0 victory over against Illinois in Beaver Stadium. How long ago was that game? Well, the Illini defensive coordinator that day was Tim Banks, who is now entering his fourth season as the Nittany Lions’ safeties coach. Hackenberg’s peripatetic journey since being drafted in the second round and No. 51 overall by the New York Jets in 2016 has included stops — but no starts, or even a regular-season snap — with the Jets (two years and $1.6 million bonus), the Oakland Raiders (three weeks with Jon Gruden), the Philadelphia Eagles (19 days in the 2018 preseason) and the Cincinnati Bengals (64 days this past fall on the practice squad). While Hackenberg did not play a single down in the NFL regular season, he did appear in eight exhibition games. His stat line for those games, from 2016-18: 66 of 137 for 600 yards, with two TD passes and six interceptions (three of them pick-sixes). His average completion went for 9.1 yards and his average attempt went for just 4.4 yards. This past week, in a run-up to Memphis’ season-opener, PennLive.com ran a long feature story about Hackenberg after visiting him at the AAF training camp in San Antonio — appropriately enough, home of the Alamo. In that story (read it here), Hackenberg said his throwing mechanics are much improved. On Sunday, it was kind of hard to tell. There’s still hope for Hackenberg. On one hand, he’s young. He turns just 24 this Thursday — yes, Valentine’s Day. On the other, in most ways, the AAF is the last stand for Hackenberg and many of the new league’s players. Of course, there’s still the XFL. Its reboot begins in 2020. For now, though, Hackenberg is hoping for a reboot of his own — and praying that he hasn't reached his own private Alamo.